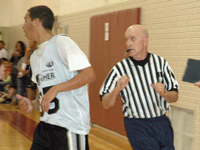 Register in each sport officiated with the Michigan High School Athletic Association. Actively take part in an officials association, including scrimmages and in-season mechanics sessions. This allows the official to stay current on rules and mechanics, discuss play situations and learn how to handle situations with coaches and athletes. Communicate your desire to officiate a particular sport with the assignors who distribute these games/matches, or in some cases, the area athletic directors of individual schools. There are several conferences within driving distance of our members. Some of them have independent assignors who assign all levels, from middle school through varsity. Others use one or more assignors for the varsity level, with the schools assigning the sub-varsity levels themselves. Bangor, Bloomingdale, Hartford, Cassopolis, Centreville, Eau Claire, Decatur, White Pigeon, Menton, Marcellus. Delton Kellog, Constantine, Schoolcraft, Lawton, Galesburg-Augusta, Kalamazoo Hackett, Kalamazoo Christian. Coloma, Fennville, Watervliet, Gobles, Saugatuck, Lawrence, Martin. Berrien Springs, Brandywine, Bridgman, Buchanan, Comstock, Parchment. New Buffalo, River Valley, Countryside, Lake Michigan Catholic, Michigan Lutheran, Covert, Grace Christian, Howardsville Christian. BC Central, BC Lakeview, Gull Lake, Kalamazoo Central, Loy Norrix, Mattawan, Niles, Portage Central, Portage Northern, St. Joseph, Stevensville Lakeshore. Allegan, Dowagiac, Edwardsburg, Otsego, Paw Paw, Plainwell, South Haven, Sturgis, Three Rivers, Vicksburg. Basketball -- V, JV, Frosh, MS for BCS Red, BCS White. Baseball and Softball – V, JV for BCS schools ((except for Comstock, Parchment, Howardsville Christian). Basketball – V for SMAC, Wolverine, SAC Lakeside, SAC Valley. Volleyball – V, JV, MS for BCS schools St. Joseph, Lakeshore, Niles, Benton Harbor, South Haven. Basketball -- JV, F, MS for Lakeshore High School. Football – V, JV for the BCS White and Red (except for Comstock, Parchment). Basketball -- JV, F, MS for SAC Valley, SAC Lakeside, Wolverine (except for Vicksburg, Edwardsburg, Sturgis), JV/F for Kalamazoo Central, Mattawan, Loy Norrix, Niles, Portage Central, Portage Northern, Battle Creek Central, Comstock, Parchment; V/JV/MS for Heritage Christian; MS for Portage Northern, Portage Central, Portage West. Baseball -- V for Heritage Christian, Kalamazoo Home School, Howardsville Christian. Basketball – V, JV, MS for SW10. Volleyball – V, JV for SW 10. Baseball and Softball – V/JV for SW10, Saugatuck, Fennville, Watervliet, Hartford, Gobles, Martin. Football -- V, JV, MS for SAC, SMAC, Wolverine, SW 10. Baseball – V for Wolverine, SMAC, SAC Valley Division. Talk to other fellow officials regarding which athletic directors do the assigning themselves for some of the sports and levels at their schools. Wrestling of all levels is assigned by the athletic directors. The SW10 matches will be assigned by John Bishop, Allegan. For any sport or level or school that is not listed, contact the FBOA trainer of that sport for whatever information he might be able to offer you.